The holidays are a wonderful time of family and fun, but with the most wonderful time of the year also comes the stress of creating a safe experience while traveling and eating at others’ homes for numerous holiday gatherings. Sometimes, we find ourselves seemingly stuck with the needs of our family on one side and long held family traditions on the other side. Some find extended family to be welcoming of change that helps include everyone while others may find it difficult to get the empathy they feel their family deserves. Although our family celebrations with extended family have not always gone smoothly in the food allergy department, I have been very thankful to have felt supported and loved by our close family members. In my experience and opinion, the less people an event has, the more likely you can create an allergen free or at least allergy-friendly experience for all. Our family rarely gets the opportunity to celebrate holidays in a traditional setting, but when we do, we have to consider many different food needs of the members of our family. I am nearing the first full year of being wheat free myself, my son has a peanut / tree nut allergy, and my nephew also has food allergies. My parents are amazing grandparents who love all their grandchildren and want them to all feel included and safe during our times of celebration together. 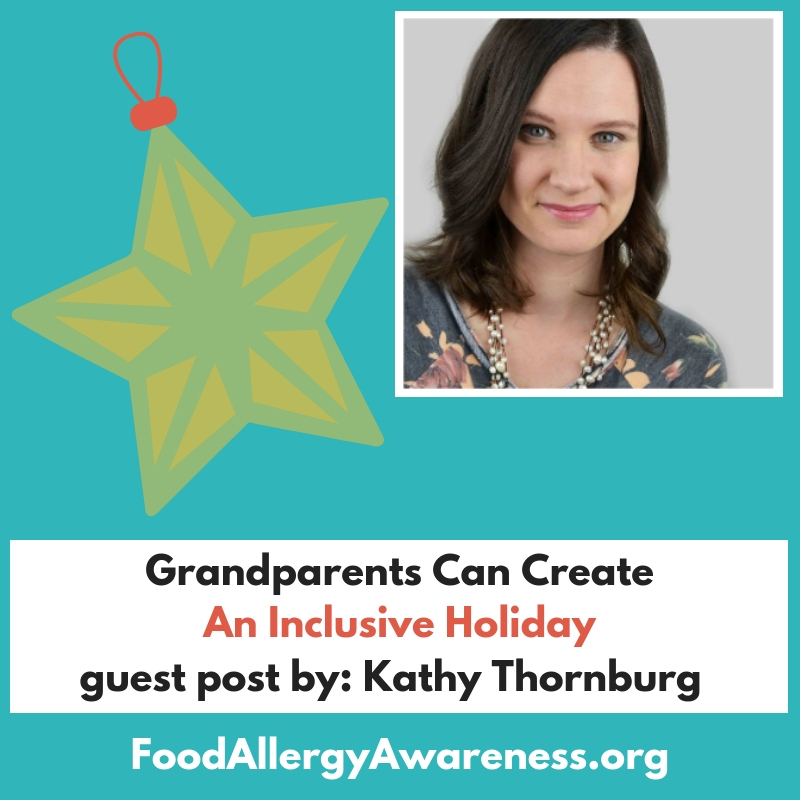 My mother and I worked together to come up with this list of tips for creating an inclusive holiday experience for your grandchildren. With many traditions revolving around food, why not start something new that includes all of the grandkids? Try buying matching PJs for all and getting a silly group picture or finding a special holiday book you can bring out each year to read by the tree. Long kept traditions are wonderful, but it’s important not to make them more important than the people you share them with. It might be time to modify or replace a tradition that is no longer best for you and your loved ones to enjoy together. Don’t toss the labels to those candies you put in the stockings or to the foods on the dinner table. Keep them with the item, near the dish that uses them, or in a folder on the kitchen counter so those with allergies and their caregivers can look over the labels before jumping in on the festivities. When attending extended family events that were prepared by several different family members, it can be hard to get enough information about the dishes and their ingredients to feel safe joining in. If your grandchildren are traveling in from out of town, chances are they might not have come with food to contribute to the large family meal. Help out by preparing a dessert that you know is a favorite and is safe for all of your grandchildren. Store it away from the dessert table so there will be enough for those who need it and so it won’t risk contamination from the other desserts. Instead of eating a big meal and exchanging presents with extended family members, have everyone contribute an item to donate to a group cause. Consider your local food pantry or area organizations and spend your time together collecting your donated items and delivering them to the organization that distributes them. You will still get to enjoy each other’s company and will be blessing others in need during the process. Instead of decorating cookies or making a lavish gingerbread house, have all the grandkids work together to make homemade Christmas tree decorations. Set up a table with clear plastic ornaments, colorful craft supplies, paint, jingle bells, ribbons, and whatever else you can find. The finished product will be a tree decorated with love and memories to cherish for years to come. Whether this is your first holiday with food allergies in your family or you have several years of experience under your belt, it’s always a good time to be more knowledgeable and inclusive of those around you. The extra effort and care you put into making this holiday season safe and enjoyable is the best gift you can give all year.